I’ve reviewed a few other thermometers and today, we have an interesting one from a company (humorously named) SALTechips. This is the ThermNeon; it uses an IN-13 bargraph tube to display both the temperature and the menu. Typically, nixie/neon thermometers haven’t had much in the way of options. With a nixie clock, you typically have four or six digits to display menu numbers and values. While these can be a little cumbersome at times they get the job done. With a bargraph tube, displaying the menu items and values takes some ingenuity. SALTechips achieves this by changing the backlight color to green (to indicate menu item selection) or red (to indicate the value selection.) The actual menu items are defined as temperatures. So, flashing green at 15 Degrees Celsius means that the menu item selected is the temperature display frequency. One of the interesting things about the backlight in this case is the way that it is used to convey information. For example, if it is cold, you can have the backlight be set to blue. If it is warm, you have it set to yellow. If the temperature is somewhere in between, the device will mix the two colors proportionately. The cutoff points for hot/cold and the colors can be set in the menu. There is one other feature that is not accessible via the menu. It is a live display mode where the temperature is constantly updated based on the input. It is interesting to play with this feature because it becomes clear that this isn’t an analog device. (Yes, you can also tell this by looking at the schematics.) The temperature does not smoothly transition but jumps in even increments. This isn’t necessarily bad because (1) it isn’t a precision device and (2) because the neon glow does not have a clearly defined top to begin with. The display itself turns on and off at regular intervals to prolong the tube life. I know that nixies, for example, can get cathode poisoning. I’m not sure how IN-13 tubes age however. I have my device set to a 50% duty cycle (display for 30 seconds every minute) but I guess I won’t know for a few years what effect it has, if any. My tube in thermometer from NixieKits.eu seems to be holding up fine but it is filled with Argon so I’m not sure how that changes the lifespan. The scale itself deserves some attention too. At 1 CM, it is considerable thicker than the neon tube. The tube sits in a channel that has been drilled out of the center so it provides stability across the entire length of the tube. The channel is just deep enough to protect the tube but not distort the display in any way. The tube is still exposed on the front and back but it is well protected. The base of the device made out of what appears to be laser cut wood. The panels are 5MM thick and fit solidly together. The photos give a pretty good idea of how the case is actually built. On the front of the device the thermNeon logo is etched. On the back are cutouts for the power, the sensor, and the buttons. On the bottom is a sticker with an abridged version of the menu. 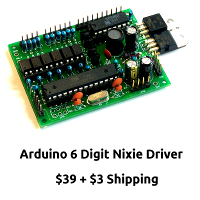 The device itself is sold as a kit for $140 or assembled for $200. With the kit version, the majority of the components are through-hole, which should make assembly easier. If you need help with the few SMD parts, SALTechips will affix them to the PCB before shipping. I will link to the assembly manual at the bottom of this article. If you’re thinking about buying the kit version, it is worth looking at. They went through great pains to photograph every step and make assembly as easy as possible. As far as powering the device, you can use a wall power supply or a mini USB connector. Both are supplied with the kit and assembled versions. The power that ships with the device is matched with the correct plug based on the shipping destination. This is a solid device. Literally. I don’t think it is going to break unless I really try to. I am a big fan of the features that this clock offers. They add functionality to the device that is actually useful to users. Overall, this is a solid little gadget. Oh man, that is embarrassing. I recorded it. Edited it. Proofed it and still missed those! I think Gaston is referring to the clock references in the text, once in the heading to the competition and once in the summary.